It is hard to believe that almost a year ago, we lost Robin Williams, a comedic genius, a star with more shine than the sun, the man that made the laughter ring out of our hearts and fill the audible sound waves around us. Gaining a person who genuinely can make you laugh because he is funny versus comedians that have to work hard to get you to laugh is the gift that Robin Williams offered the world. Robin’s one-liners, his subtle motions, his quirkiness and fun friendship with Billy Crystal all were things that made Robin Williams a gift to the comedic world. You never knew what was coming next with Robin Williams, but you were sure to be entertained and intrigued as no dust would settle between his words. Fun, whimsical, characters with depth and a gifted intelligence is what Mr. Williams offered us and no character that he would portray would ever just be a ‘character’ as each was spirited, boisterous, and creative work of Robin himself, who was a perfectionist and gave life his all. Watching Williams on Mork and Mindy was the weekly reason I did my homework, just so I could see, laugh and enjoy the fun with this man who traveled to earth in an egg(Mork). I believe Mork(Robin Williams) already knew that many of us lived life in a fragile eggshell and if he could crack it for us with laughter, it might set us free from the daily grind of life. Life was a bit lighter, a lot more humorous and completely hysterical when Robin Williams offered his comedic dust to anything. I believe Aladdin is what I remember most about Robin Williams, because his character was not only a friend to Aladdin, a buddy of sorts, but also a lively soul who made you ‘grasp’ life and live it through his vivacious voice! Robin Williams was the hysterical, fast-talking, witty-banter-snapping Genie with a big personality who wore it out loud for everyone to love and adore. My oldest son just laughed every time the Genie was in the scene, which meant Robin Williams was working his magic on every genre not just adults. The Genie in Aladdin was just about as popular as Aladdin himself because he was so fun and fueled friendship in a new way for his pal Aladdin. The vibrant personality that gave way to the magical voice, created that ‘Pixie Dust’ that seems to be sprinkled in much of Robin’s work. Perhaps the gift I most appreciate about Robin Williams is that he never seemed to hold back, be it: outlandish, silly, sincerely emotional and he was connected to each and every character he portrayed as well as to each of us, as he was genuine. It would seem that life had other plans for Robin, almost as short as his cameo on FRIENDS it is with sadness that at his age, he is gone. I am sure so many of you feel the same way, as we banter each and communicate each day through my blog and social media, I have learned that many of you miss the comedian who offered so much laughter to us all. 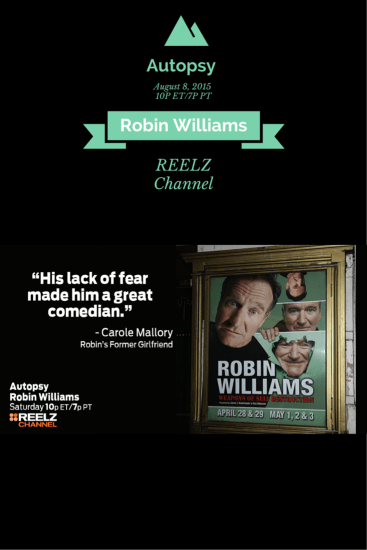 What better way to celebrate his life than to learn more about his death and you can when REELZ Channel offers us the opportunity to view the premier of the Autopsy: Robin Williams special on August 8th at 10PM Et/7PM PT. It’s time for some real answers, some more information and closure to a death that is hardly funny. So much talent is gone, and no more funny moments to share with Robin Williams, it’s just all the memories. Maybe Mrs. Doubtfire said the most and eerily so: “Well, He broke the mold when He made me. He made me very special.” while quite out of context, and not quite the conversation Robin Williams was having with the Bus Driver, it still conveyed Robin Williams every moment in this world, special, funny and unlike any other out there. Join in on the celebration of Robin William’s life when REELZ Premieres Autopsy: Robin Williams and lavishly live entertainment and closure out loud! I will set up the DVR to record this show. Thank you so much for sharing this information! My family and I loved Robin Williams and were so saddened by his sudden departure. I think it is so sad how he died. He brought so much joy and laughter to so many people’s lives. To think that he was all alone when he needed support is heartbreaking. I bet this will be really great to view. I loved Robin Williams and hated to see his life end in this way. I miss Robin Williams and am grateful that he left so many great movies and shows to remember his talent. He was a one-of-a-kind and wonderful man that definitely made the world a better place. I didn’t know about the special on Aug 8th, but I want to tune in to watch!